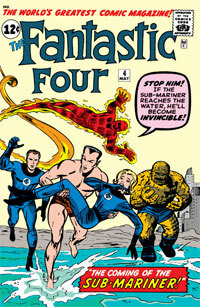 The Thing is a founding member of the Fantastic Four. He also has the most to be upset about when it comes to what they all became. Ben Grimm objected to the test flight, saying it was unsafe due to the cosmic ray’s. Unfortunately for him, he was right. He is also the only member of the team, to be drastically made inhuman by the ray’s. Both in body, and possibly at times in action. He struggles to hold onto whats left of his humanity while he lives in the body of a monster.It is hinted that he never fully forgives Reed For what had happened. Despite this, he does join the Fantastic Four. Not only does he have an uneasy relationship with Mr. Fantastic, but The Human Torch. He once quit the Fantastic Four, thinking they where keeping things from him, it turned out all they where keeping from him was an experiment that was designed to help him, but they did not want to get his hopes up too soon. Ben Grimm, has taken in Alicia Masters as a close Friend. Alicia Masters is the blind step daughter of The Puppet Master, she also has a strong fondness for Ben.